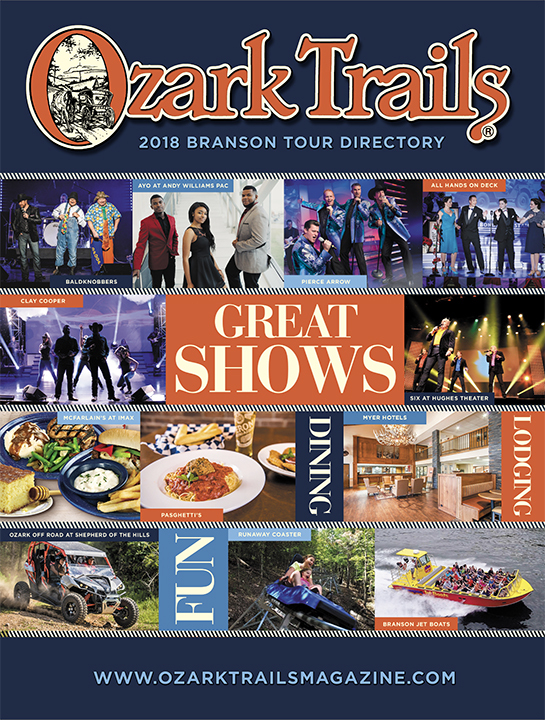 In a town that prides itself on its patriotism and appreciation for military service, “All Hands on Deck” is undoubtedly the “most patriotic show” in Branson. Performing for its first season at the Andy Williams Performing Arts Center and Theatre and its third season in Branson, theBroadway-style musical production preserves the memory of the 1940s USO show. Created by Broadway veteran Jody Madaras, “All Hands on Deck” features four singing and dancing stars, the nine-piece Hollywood Victory Caravan Orchestra, and 42 songs that became hits at a time when American families gathered around their radios for the latest war news and popular music. Madaras’ production is based on the story of the once-famous Hollywood Victory Caravan which brought film stars together in a traveling show to sell war bonds and rally support for the nation’s unity. On stage, the four characters travel by train from city to city presenting songs, dance, skits and classic commercials. Madaras discovered that the Victory Caravan had apparently never been featured in a production. “It was a huge part of the war effort and no one had ever fully honored them,” he said. Madaras serves as director and choreographer as well as starring as film entertainer Ted Crosley. Valerie Hill stars as actress Betty Blake, Kelly Murphy as Daisy Maxwell, and Jonathan David Steffins as John Handley. Justine Long also performs as Daisy Maxwell. All have extensive experience in theater and performance venues in New York and other major cities. Also featured is “Ollie,” a 1952 Willys Navy Issue M38A1 Shore Patrol Jeep, which can be seen on the streets of Branson and on display at the theater. Among the favorite wartime songs performed in “All Hands on Deck” are “America the Beautiful,” “By the Light of the Silvery Moon,” Chattanooga Choo-Choo,” “Don’t Fence Me In,” “I’ll Never Smile Again,” “Moonlight Bay,” “Rosie the Riveter,” “Sentimental Journey,” “Thanks for the Memory,” and many, many more. The nine-piece Hollywood Victory Caravan Orchestra is also featured and includes some of the Branson area’s finest musicians. All four performers and the orchestra are on stage for almost every minute of the lively production with songs, dances, comedy and the spirit of the times. The music is nostalgic and sentimental, and inspirational as well as it affirms timeless American values. Madaras’ inspiration for the show stems from his own background, growing up on an Ohio farm in a strongly patriotic family. The music is what he and his family heard often. His grandmother was very active in the American Legion Auxiliary. His grandfather emigrated from Hungary in 1911 and became an officer in the U.S. Navy in World War II. The production embarked on highly successful national tour in 2012, playing to sold-out houses all across the United States. Performances are scheduled September through December 2018. Bus and tour groups, military and class reunions, and all other organized groups are encouraged to attend. Group information is available by calling Sue Panepinto at the Andy Williams Performing Arts Center, 217-417-4178 or emailing sue.AHOD60@gmail.com, or by contacting the Andy Williams PAC box office at 417-334-4500 or andywilliamspac.com. More information about the show and its performers can be found at www.allhandsondeckshow.com.